Learning to calm childhood fears comes with the job of being a parent. When little ones wake from bad dreams, it's up to mom and dad to turn on the lights, chase away the shadows, and help them feel safe. However, for too many children, the dangers lurking in their environment are far more than phantoms. They are at risk from preventable infectious diseases that can kill or injure them for life because their parents were too afraid to have them protected by vaccines that are safe and effective. "Emerging diseases like Zika, EV-68, MERS and Ebola and reemerging resistant infectious diseases are threats we have to fight. Losing children to preventable diseases when vaccines are available or having them injured for life is such an unnecessary tragedy," David Kimberlin, MD, co-director of the Division of Pediatric Infectious Diseases at Children's of Alabama and professor of pediatrics at UAB, said. "The recent measles outbreak in Minnesota is an example of what can happen when enough children are left unprotected." Heavy lobbying by antivaccine activists in the immigrant Somali community had raised fears to the point that a large population of unprotected children only needed one vulnerable child encountering the germ to ignite an outbreak. "This generation of parents doesn't fully realize the risks they are taking when they don't vaccinate. They are too young to remember iron lungs from polio or babies dying from measles. Public health has done its job so well that younger adults haven't seen how bad these diseases can be," Kimberlin said. 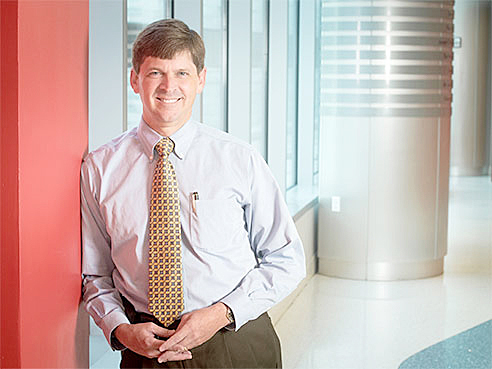 In addition to having served as president of the Pediatric Infectious Diseases Society (PIDS), Kimberlin is the editor of the American Academy of Pediatrics' Red Book, which establishes which vaccines should be given, when and to whom. "When doctors talk about vaccinations, we need to remember to speak in the language regular people use," Kimberlin said. "'The science is settled. Vaccinations don't cause autism.' Repeat it again, over and over, whenever the subject comes up." After the theory of a vaccination-autism link was thoroughly debunked, activists have continued to base their concerns on the logic fallacy assuming that because two things happen near the same time, one must cause the other. However, it is a coincidence of timing. Most vaccinations begin when the child's immune system has reached the optimum stage of development. That same stage of development is when symptoms of autism become more apparent compared to expected behaviors at that age. In fact, recent research has found indications of autism in much younger babies as well as a correlation with fevers in mothers during pregnancy. Many suspect genes have been linked to autism, but why they seem to affect some children and not others is an open question. A great deal of additional research will likely be needed before the causes of autism are definitively identified. We can't yet tell parents exactly why autism happens. What we can tell them as a proven fact is that infectious diseases could kill or permanently injure their children, and the best way to protect them from that danger is to use vaccines that have a proven track record of being safe and effective. "With everything in life you have to balance benefits against risks," Kimberlin said. "You need water to live, but you can drown if you fall in a mud puddle. The few side effects we occasionally see from vaccinations are usually very minor and we have medical resources to deal with them. The benefits are overwhelming. The best way to protect your children is to vaccinate them," Kimberlin said. Also in the news are infectious diseases affecting children that aren't understood well enough yet for vaccines to be available. "Zika emerged in Brazil last year to cause serious health issues in infants born to women who contracted the disease while pregnant. By the end of the season, it had reached the southern coast of the United States. So far this year, we haven't received enough data to know whether the strain we were following along the coast was eradicated or burned itself out, or if we might see it reappear later in the season. The situation will be monitored closely while researchers continue to work on vaccines and other interventions," Kimberlin said. Another emerging disease that became an issue a few years ago was EV-68, an enterovirus that may mimic a common cold at onset, but can quickly become a respiratory crisis, especially in small children. In a small percentage of patients, a polio-like muscle weakness can develop. "Fortunately, we only saw a few cases compared to the numbers in states at the epicenter of the outbreak," Kimberlin said. "It gradually faded, but the virus is still out there. We need to learn more about it so we can be better prepared to deal with it in the future." Fears of an influenza pandemic affecting both adults and children have also been a concern in recent years. "Right now, we're following the H7N9 avian virus in southeast Asia. So far, it doesn't spread as easily as some strains, but if it mutates to become more transmissible, it could become an issue" Kimberlin said. Reemerging Tuberculosis is another story that has been making news in Alabama. "We had an outbreak in one of our southern counties where the infection rate for tuberculosis was higher than in many third world countries," Kimberlin said. "We were fortunate that this strain responded to medications and we were able to treat patients and stop the spread of the disease. However, resistant strains in other countries are a concern that reminds us what a lethal killer tuberculosis was not so long ago. Resistant TB has come as close to us as Atlanta, where a passenger on a landing flight was infected. "What happens in other countries should matter to us. We need to help people in other parts of the world stop diseases - first because it's the right thing to do, and second because if we don't stop them there, we could quickly find ourselves struggling to stop them here. In the age of air travel, the world is a small place as far as bacteria and viruses are concerned." Resistant bacteria also brings up the issue of the overuse of antibiotics, which in years past were prescribed perhaps too often, particularly in children. "Not long ago, parents would feel cheated if they brought their child to the doctor for a cold and didn't leave the office with a prescription for antibiotics, even though antibiotics do nothing for a viral infection," Kimberlin said. "Now parents are becoming more savvy. We should continue to educate them. When needed, antibiotics can work wonders. But we have to be selective in when we use them and make sure they are used correctly to avoid teaching bacteria how to outsmart the antibiotic. "There are also growing concerns about the body's microbiome and how antibiotics may have negative effects by killing off helpful microbes the body needs to stay healthy. Whether the effects on young immune systems that are just now forming have a greater or long term impact are questions that will take much more research to answer." In the meantime, what are the best ways to protect our children from infectious diseases? "Immunize for the preventable diseases where vaccines are available--and teach our children how to avoid infections," Kimberlin said. "Germs spread through groups of children quickly. Young immune systems don't have antibodies to as many infections, and the way children play and touch and interact tends to spread germs quickly. They can bring germs home from school and daycare and infect the entire family. "We need to have infection deterrent measures in place wherever children gather. Most of all, we need to teach our children about hand washing, using hand cleaners and coughing into their arm. We need to model healthy habits for them until they become second nature."